There's not much more into this than a tablet dipped into some lava, but its pure unadulterated fun to do nonetheless, especially if it is the world's most popular slate. 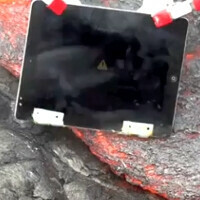 A small case company made this publicity stunt, trekking to a place near one of Hawaii's volcanoes, and getting up close and personal with the hot furnace of melted lava slowly making its way down. The CEO hung an iPad 2, which was rotating pictures of the company's products, on a pole, and started torturing Apple's slate for the joy of all Android fans nearby. We kid, but the iPad 2 did perform for a while, then showed the overheating warning we are accustomed to from the days we saw Apple's gear baking on a barbeque grill in another stunt, and gave up the ghost. Watch the pointless marketing experiment in its entirety in the video below. dont quite see the connection between the case and the ipad. I thought it was going to be something crazy like the ipad survives lol. oooohhh... what the f*ck????? NO CONNECTION with THE CASE!!!! I guess thats why it was pointless!!!!! You know ... I was surprised the iPad faired as long as it did. Now I know what Android fans fapfapfap to. I don't understand the point of this except to play with some fire. Oh well. How dare he tortures a quality product. Why not field test it on an Android tablet since no one cares for them anyway?